Everyday, I knit a bit on each of these projects. The curtain gets a minimum of two rows per day, 200 stitches per row. I estimate I am about halfway done, plus 10% for shrinkage, plus curtain rod sleeve. The curtain requires a lot of counting, not so much the shawl, except for the increase rows. Some days I am tempted to work on something short and sweet, but we all know where that path leads - more UFOs. Denim is one of those yarns where I like the destination more than the journey, because it is so inelastic. 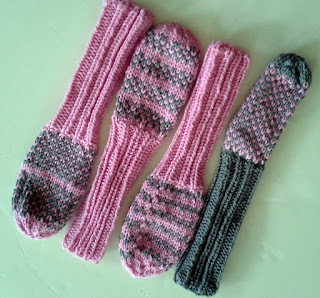 Unfortunately, it also shrinks lengthwise, so one needs to knit about 10% more than the measuring tape indicates. And since, I am knitting a curtain, there will also need to be a bit extra for the sleeve for the rod. This is going to be one heavy curtain. Linen (another inelastic yarn) would probably have been a better choice, but denim is what I had, so denim is what I knit. Most shawl patterns start with about 3 stitches. Initial progress seems rapid, despite the increase rows. But once there are over 200 stitches on the needles, things bog down a bit. The photo above was taken around row 98, 223 stitches. I'm now on row 112, 247 stitches. The finished shawl will be 176 rows, 391 stitches. Gah. I had every intention of making pompoms for my golf club covers. In fact, I did make some. My g'daughter glommed onto the first one, the second one turned out okay, the third one fell apart when I tried to tie it off. Then I decided I was not a pompom kind of girl. Since I play on a par-3 course, I don't have much call to use more than one driver. And I find fiddling with the covers to be a PITA. However, the covers are cute and add a bit of panache to my tired old clubs.